The release of the MacBook Pro in late 2016 brought the first of its kind: touch bar technology. The new MacBook Pro comes in the standard 13 inch and 15 inch sizes, with a sixth-gen Intel processor and the (in)famous touch bar. While the new Apple products continue to become slimmer and smarter, the touch bar has been a feature that replaces the functions row of keys, and makes all your favorite apps come together on one platform. Apple has been adamant about making the screens of their laptops, touch-free and they want their customers to use the keyboard as a primary place of work. Consequently, the touch panel is a slim bar that performs simple functions, such as increasing or decreasing volume and pausing or playing videos. The touch bar also comes equipped with a Touch ID that replaces the power button. 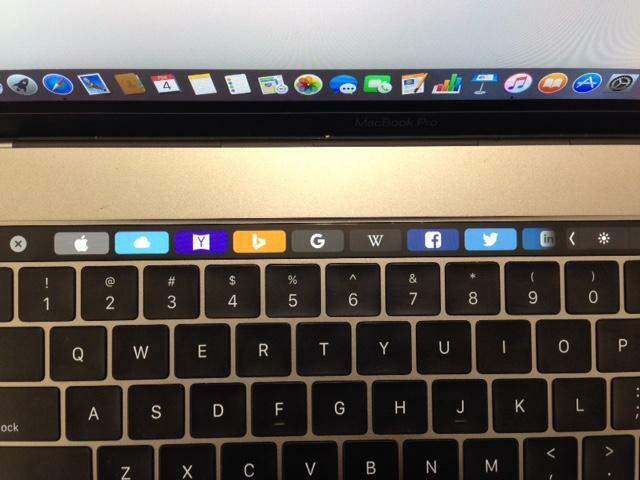 The touch bar pretty much adapts to the task being performed on the MacBook Pro. For example if the user is on a Safari window, the touch bar would display some suggestions of popular websites (as pictured above) or if the user is on iTunes, the touch bar would display the music the user owns, along with the play, and pause buttons. The question is, does the slim, fully customizable bar justify the MacBook’s whopping price of $1,799 for the 13-inch model and $2,399 for the 15-inch model? While the touch bar seems pretty creative with the implementation of different features and suggestions, its uses stop there. The touch bar is pretty small and thin in size and offers nothing else that the MacBook, alone offers. Many technology community websites, such as Gizmodo.com, have considered the Macbook touch bar to be nothing more than gimmick, while others say it solves a nonexistent problem. There is news of the touch panel being revolutionary and being a new step in the field of technology. The touch bar shows a mostly blank display, consisting of Siri and the volume buttons when no tasks are being performed on the MacBook. If you are debating whether the extra $300 is worth it to buy the updated version of the MacBook, then it all comes down to the type of user that you are. While the average user might not require or find the features of the touch bar handy or useful, the innovative pioneer technology may be mesmerizing to the intensive tech worker. As Apple products become slimmer and lighter, we can’t help but wonder what else Apple has in store for us but while the touch panel has potential in the future, it just hasn’t reached the bar yet.